You can find some of the top decision-makers in a company with an exclusive list of those working in the management departments of numerous institutions. Get an email list of managers after just a few clicks with this ready-made data product. Do you want to talk directly to a group that's often responsible for the primary operations and overall management of an organization? Finding and connecting with the people who have a key role in an organization and the power to make decisions is often the most difficult part of a business-to-business (B2B) marketing campaign. Luckily, getting in touch with the top decision-makers of a company is easier than ever with Bookyourdata.com. With this premium pre-built contact list, you can find the staff, professionals, and executives working in management departments of many different companies and organizations in one go! 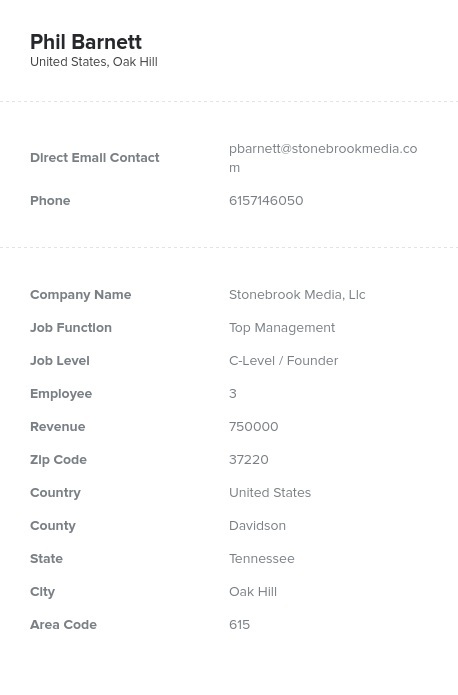 Bookyourdata.com's ready-to-download contact directory of managers contains all of the information you need to conduct a successful marketing campaign: emails, phone numbers, titles, and much more. That means that you'll be able to call and email managers directly. Those who are responsible for the planning or organization of an entire company can help to initiate changes that can positively impact yours. Let them know about your innovative product, new software, or exciting service. Moments after purchasing this list, you can integrate it into your CRM and start contacting the key influencers in management departments. Find a diverse group of managers now with Bookyourdata.com!